Sonicraft A2DX Lab was designed to meet a specific need in the professional audio community: to provide the ultimate open reel analog-to-digital transfer service. We support every studio-grade and project studio analog tape format and noise reduction system used in the USA as well as Europe and other parts of the world. If it’s on open reel analog tape, we can transfer it into the digital domain with unsurpassed quality. One of the most remarkable achievements of the team that put together Sonicraft’s A2DX Lab is our fleet of fully-restored and extensively modified Ampex MM1200 multitrack machines. We chose the Ampex MM1200 over any other multitrack platform for a number of reasons: sonic excellence, ability to control challenged tape, simplicity of design, availability of parts, and availability of significant upgradable components. 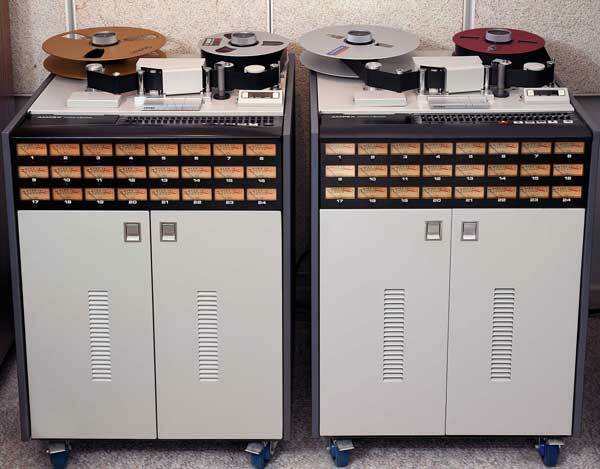 Before we tackled the first A2DX Ampex MM1200 restoration project, we did countless hours of research, testing, prototyping, and comparisons. We wanted to determine what kind of improvements over stock performance we could achieve. We investigated changes in heads, components, and signal paths, as well as other modifications. And, we discovered a wealth of innovations, products and strategies that would allow us to achieve significantly better multitrack analog playback. Our expectations for the outcome of the restoration project were high. But, when we finally brought our newly renovated A2DX Ampex MM1200 on line, it yielded detail and sound quality well beyond what we hoped for. Today, Sonicraft A2DX lab utilizes a fleet of four fully rebuilt MM1200s accomodating a variety of tape formats including: 2″ 24-track, 2″ 16-track, 1″ 16-track,1” 12-Track, 1” 10-Track, 1″ 8-track, and 1” 4-Track. At the top: Ampex 440Cs fully rebuilt with Flux heads, RTZ record and repro amps, fixed precision guides and constant tension mods. Top left optimized for 1/4" 2-track at 3.75 & 7.5 ips. Top middle configured for 1/2" 4-track or 1/2" 8-track. Top right optimized for 1/4" 2 & 4-track. See 440C tech notes for more detail. Also shown: Tascam MSR-16 (bottom left) and MSR-24 (bottom right) 1/2" 16-track and 1" 24-track machines coupled with 24 channels of line amps to drive 24 channels of pro level Dolby 422 B-C-S decoders. Can also be patched to a rack of 24 channels of professional dbx, Dolby A or Dolby SR noise reduction. Half-inch 8-track, 4-track and 2-track tapes as well as quarter-inch 4-track, 2-track European DIN stereo and full-track mono, can all be transferred into the digital domain with ultimate quality on our thoroughly customized Ampex 440Cs.Half-inch 3-track tapes are transferred on our ATR 104. Basically a subset of the Ampex MM1200, these machines provided the platform used to prototype the A2DX Ampex M1200 improvements. The machine on the right was the first machine to undergo the A2DX restoration and enhancement process. Extensive listening tests have proven these machines to be amazingly accurate as well as “pleasantly transparent”. Furthermore, performance of the transports of these machines has been dramatically improved over stock units. As mentioned above, we can configure our fully optimized Ampex 440C machines for ultimate 1/2″ 8-track and 1/4″ 4-track transfers. 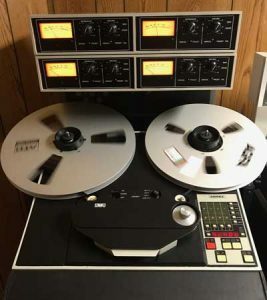 Additionally, we carefully maintain the full complement of analog tape machines needed to make excellent transfers from even higher track-density project studio formats like 1″ 24-track, 1/2″ 16-track, Akai 1/2″ 12-track and 1/4″ 8-track. Every possible combination of track format, reel size, tape speed and noise reduction system is supported. If your 1/4″ 8-track, 1/2″ 16-track or 1″ 24-track tapes were recorded on Fostex or Tascam machines, we have important information for you. The bad news is, all of the Fostex G-Series machines are currently disintegrating due to defective early surface mount technology used to manufacture them. And, Fostex and Tascam machines that utilized Dolby C or S noise reduction are also failing due to permanent degradation of the consumer-grade Dolby NR chip sets used in their manufacture. The good news is that we have the ultimate solution. Determined that no client’s tapes should be orphaned, we tracked down and installed 24 tracks of professional Dolby 422 B-C-S decoders. We can now bypass the failing noise reduction circuits built into the machines and use these decoders instead. This cloud has a silver lining. By installing these Dolby 422s, we solved a lot more than the problem with failing noise reduction circuits in the machines. We can now make transfers remarkably better than any that could ever have been made on stock Tascam and Fostex machines. First, Dolby 422 decoders deliver stronger, fuller bass and quicker, more open midrange and highs than the stock machine’s consumer chip sets ever did. And, second, their ready adjustability allows us to tune them individually to your tapes for tighter, cleaner, more open sound. This is not just a subtle tweak. It’s a significant upgrade. If your 1/4″ 8-track, 1/2″ 16-track or 1″ 24-track recordings were made using Dolby noise reduction, you’ll hear the music on them like never before. Fortunately, machines using dbx noise reduction are holding up much better. But we still bypass the consumer grade decoders built into them and take advantage of our professional dbx rack for the sonic upgrade it provides. 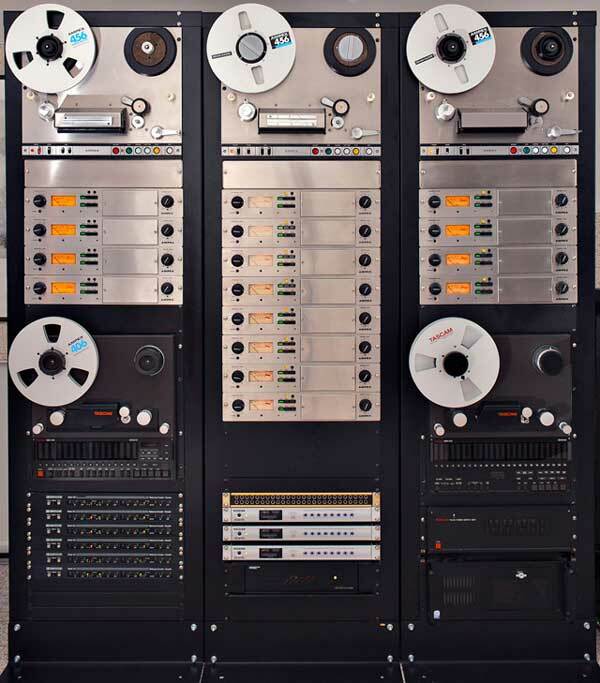 Half-inch 2, 3, and 4-track tapes and quarter-inch 2-track tapes can be transferred on this Ampex ATR-100 fully rebuilt from the ground up to our uncompromising standards. Especially delicate 1/4″ 2-track tapes are best played on this fully restored Studer A80 RC. Additionally, we have completely redesigned the entire playback system in this machine. A Flux Magnetics playback head was custom built by Greg Orton and mated with totally redesigned playback electronics by our own John Chester. The sonic purity of this machine is absolutely stunning and, for transparency, outperforms anything we’ve ever heard or tested. 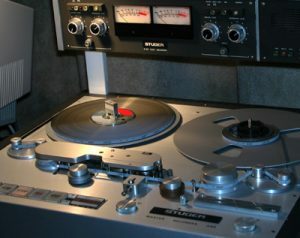 Tapes recorded and stored on European AEG / DIN hubs can be played as-is or moved to standard NAB reels for transfer on any of the A2DX 1/4″ mastering machines. Sonicraft A2DX maintains the full range of professional noise reduction systems including 24-track racks of Dolby A, Dolby SR, and dbx Type I. Furthermore, we’ve taken vital steps to prevent undesirable degradation of your transfers by ensuring optimal tracking of the noise reduction systems. Sorting through the many configurations of professional noise reduction systems was an enormous job. We needed to be sure that the latest versions of each were indeed the best and would be fully backwards-compatible with tapes made on earlier systems. We purchased, rented and evaluated practically every style of Dolby and dbx noise reduction system. 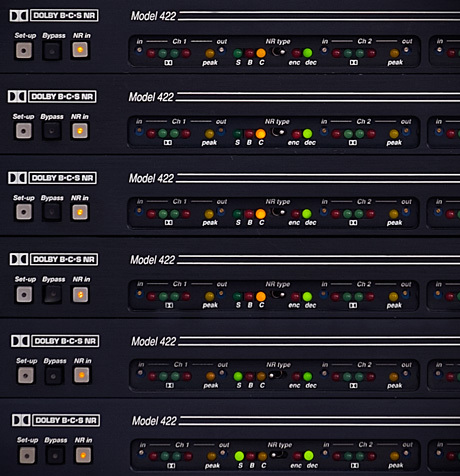 In fact, for dbx Type I decoding, we purchased and evaluated a total of six different dbx multitrack noise reduction systems before we made our final decision. Both the Dolby A system and the Dolby SR system are Dolby’s latest design and are housed in XP racks. 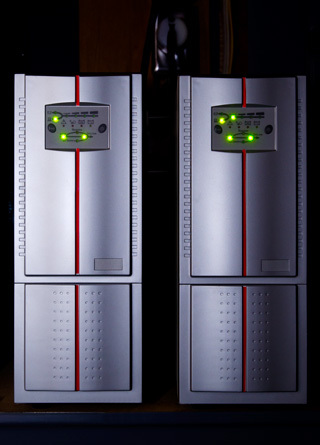 The dbx Type I (professional) system utilizes 911 modules in 900A frames. Also installed are 24 tracks of Dolby S and 16 tracks of Dolby B & C in the form of six Dolby 422 professional systems. Each of these represents the latest and best of its kind, all meticulously maintained and calibrated. Sonicraft A2DX analog-to-digital converters are current Mytek 8X192 units capable of up to 192kHz / 24-bit sampling. These converters are truly amazing and have been chosen for their ability to capture every bit of the quality, accuracy and detail of sound that we have worked so hard to deliver to them. Beyond that, our 8X192 A2D converters have been factory-modified with precision calibrated 2 db stepped attenuators so we can more accurately tune their individual channels to the levels on your tape. Sonicraft A2DX runs off of battery power at all times. During fast-forward or rewind, it’s not uncommon for tape to reach speeds in excess of 20mph. So, what happens to your tape if the power fails while the machine operator is rewinding it? Here at Sonicraft, the answer is “absolutely nothing”. That’s because at all times, Sonicraft A2DX lab runsentirely on battery power. Nothing is running off of public utility power — not even the digital audio workstations. Instead, the public utility power is used to charge batteries. This battery power is fed to a pair of very high grade of inverters which together produce 5000 watts of exactly 120 volt pure 60 Hz sine wave power — enough to power the entire lab with complete ease. 5000 watts of 100% stable battery power means bulletproof power reliability, rock-solid tape transport behavior, and super-clean ultra-regulated power to the analog circuits of tape machines and noise reduction systems, A2D converters, digital audio workstations and anything else your transfers come into contact with. It’s every sound purist’s dream come true. As for audio wiring in the Sonicraft A2DX transfer lab, all of it is done in short discrete runs of the very highest quality and heaviest gauge Mogami or Canare cable. All patch bays and patch cords are quarter-inch military grade products and all connections are meticulously hand-soldered. And we have implemented sophisticated technology that isolates the analog equipment from the power fed to the computers. We support virtually every format of open-reel analog tape, as well as Dolby A, B, C, S, and SR as well as dbx type I and II noise reduction formats.